Christine Sapp, Stanley Macon, Sr., Vivian Sapp Macon, Roscoe Sapp, Unknown, Jennie Sapp Davis, Irene Sapp Keitt, Emerson Sapp, Wardeen Sapp Miller, J.Jasper Sapp, Jr. I was extremely excited the past couple of days because of the information I was able to find on these two people. I knew only what I had heard about them from other family members. I just recently learned that they even existed here in the past year. Remembering that I had seen pictures of them early in my life, but didn't know who they were. When I got these photos in my hand and was able to ask about them, my grandmother, who owned the photos, was well into Alzheimers, and could not remember. It was not until I moved to California with these photos and showed them to other relatives that I discovered who they were and how they were related. I realized that Emerson and his sister Jennie was at my great-grandfather's funeral in 1962. As I put their names in my ancestry.com family tree I was able to truly connect them to my family, but there were still so many unanswered questions. I had heard that Emerson was a doctor and had donated his body to UCLA for research, but I had no idea when he died. So I looked high and low for information on these two. I found two other Emerson Sapps that fit the same birth year and was born in Georgia. I knew that he moved quite a bit as a child. From Millen, Jenkins County, Georgia, to Jacksonville, Florida,to Brunswick, Ga. and then to Manhattan, New York. They were apart of the Great Migration in the 1920s to 1940s. Since the 1930 census is the last that is available to the public, I don't see any record of him until about 1952 in the California Voter Registration records, along with his wife Hortense. While researching Google Books, I found old versions of the Billboard magazine, dated in the mid-1940s, that showed an Emerson Sapp and Hortense Sapp that were owners of the Florida Blossom Minstrel Show. I was really surprised to see that. Even though he was considered mulatto from mulatto parents, I know the pride that the Sapps had in being African American, but I didn't dismiss it. Now after the research I was able to do at USC's Doheny Library using their ProQuest database. 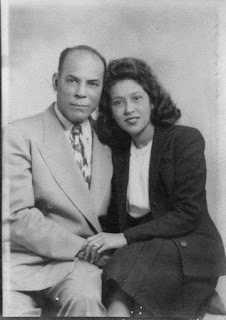 I located the digitized archives of the Los Angeles Sentinel, an African American newspaper her in Los Angeles. This archives dated back to 1942. Well I hit the jackpot and was able to dismiss the Emerson and Hortense associated with the Florida Blossom Minstrel Show; or should I.
Walter Emerson Sapp was a well-known Real Estate Broker and a graduate of Morehouse College in Atlanta, Ga. I have no idea when he graduated from Morehouse, but I do know that in 1959 he was the treasurer of Morehouse's Alumni Association. His wife Hortense was a Professional female golfer and a member of the all female golfer club called the Vernondale Golf Club of Los Angeles. The first record I find of her winning trophies on behalf of the club, which travel all across the country, was in 1952. The club started in 1947. 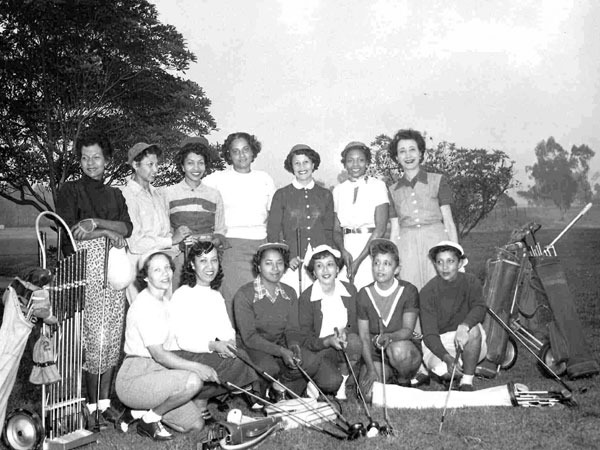 This was really exciting to me to not only see so many female golfer in the 1950s but better yet, an all African American female Golf Club. I discovered that the two attended and was very active in St. Philip Church, where I will continue my research. I have yet to prove that his body was donated to UCLA but I am still working on that. Somehow I get the feeling that there is much more to find out about the lives of this couple. I did find out that Walter Emerson Sapp passed away on July 17, 1966 after a heart attack. He had lived in Los Angeles for 17 years, therefore he moved here in 1949. He is buried at the Angelus Rosedale Cemetery, which was the first cemetery in Los Angeles opened to all races. Here is a link to the write up in the Los Angeles Sentinel. This research was great because I found out what the first initial W. was for in Emerson's name, Walter; I found out the name of his church, when he died, how he died, what funeral home was used as well as where he is buried. Not only that I may be able to dismiss the other Emerson who also has the first initial of W., or can I.
Emerson didn't move to California until 1949 and it was the early 40s when Emerson is said to have owned the minstrel show. He did leave New York and go back to Georgia because he went to Morehouse College. So maybe I have to dig a bit deeper to be sure. I will have to update you all on this one.